Earlier this month, about a week or so after Dennis had passed away, New Years Honours were awarded; MBEs for sports stars, knighthoods for celebrities, there were also many ordinary people up and down the Country that received recognition for what they had done for others. Uncle Dennis never received an award as such, but we all know he was the sort of guy who surely deserved one for he was very much a person who would help out absolutely anyone and over many, many years has no doubt done something for probably the vast majority of people in Church today. One very practical way that Dennis helped others was making available space in his house for people to live when there was a need. My sister Michelle, her friend Nayna, Cousin Lee and my brother Mark have all at times lived at Dennis’s house. When I was 21, I found myself in a difficult situation with nowhere particular to live, it was Uncle Dennis that offered me a place to stay. I didn’t know Dennis particularly well at that point but it was over that 2 and a half years that I lived there that I really came to understand what he was all about. Uncle Dennis was a very quiet, very humble man who went about his life. He worked nights at TNT so as I would often be coming home from work or a night out with friends, Dennis would be getting up for work. I’d be just about getting ready to go to sleep on a cold night and would say to Dennis how I didn’t envy him going out to work throughout the night in the cold. Other than the usual Dennis grumbles which we all knew and loved, he didn’t particularly moan – he just got on with it – that was very much his way. With his simple cheese sandwhich in a plastic food bag and perhaps a tomato to take to. He never really ate very much. In fact, he had a fairly rigourous routine – you could guarantee that at any time of the year, on any particular day you could open his fridge or a cupboard and find the same items – Bread, Cheese, Tomatoes of course a bottle of Whiskey somewhere in a cupboard and of course a Fray Bentos pie. Living at Uncle Dennis’s for the time I did allowed me to save up for my first house. And once I had got enough money together I was able to move out. Dennis wasn’t done then of course with helping, he was a regular fixture coming round helping with maintenance work and other errands. Particularly so when Dad had his stroke and became Chief Foreman with Dennis ably filling the role of Apprentice. Dennis was also full of surprises, I remember when he was taken into Addenbrokes for an operation and had to be kept in for a few days. I remember thinking that this wouldn’t be easy for him – out of his routine and no doubt in a ward full of people he didn’t know which may be uncomfortable for him. I made a point of visiting to check that he was OK and rather than finding him sat in a corner alone, he was leading a deep discussion with the other guys on the ward about cars. Dennis had found his audience and I think he was actually a bit sad when it was time to come home. Even when I was ready to move out of my first house at Elm Road after a few years to my next house, it was Uncle Dennis who was there lending a hand. The week I had to move was frantic for me and I was working in Cambridge full time for a month leading up to the move. So every night I’d box up items to be moved and at some point the following day Dennis would turn up to pick up the items and take to his house for storage so that when the day of the move came things would be less stressful. Even once I had moved, Dennis would turn up to cut my grass when it needed doing – I had my own lawn mower, but he didn’t like it of course so brought his own along to get the job done. One particular day Mum and Dad were visiting and we spotted Dennis was in the garden cutting the grass so I quickly made him a cup of tea and went to take it down to him – by the time I’d got there he’d cut the grass and gone – no hanging around to wait for thank-yous. Off he went to get on with something else – that was is way. I always wondered if Dennis was happy, he seemed content and he never particularly complained about anything so I guess he was – I certainly hope he was. 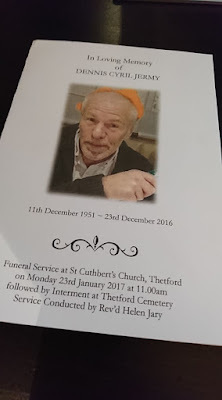 Since my Dad had his stroke he’s become a much more sociable person – sometimes frankly we can’t get him to stop talking or using the telephone – as I am sure many of you can now appreciate. And whilst of course we would all have wished it never had happened it has been so nice to see over recent years to see the time that Dennis and Dad have been able to spend with each other. Uncle Richard too has become a prominent member of the gang, particularly since Aunty Yvonne sadly passed away. Trevor, Dennis and Richard – a trio of likely suspects if ever there was one. But the fun that they had together was plain to see and always made me smile. I was genuinely concerned on occasions that they were laughing so hard they may cause themselves an injury. One such occasion was no doubt last Halloween when we decorated Mum and Dads house ready for trick or treaters but it was Dad and Uncle Richard who dressed up in costume and laid in the front garden in wait having already telephoned Uncle Dennis asking him to pop up. Once Dennis has been suitably scared, he got his own mask and took up a spot in the front garden. Dennis didn’t have many hobbies as such but something he did enjoy doing was visiting Car Boot Sales – not content with visiting a morning bootsale he would often visit an afternoon one at a different location on the same day. Despite no doubt dozens and dozens of bootsale trips Dennis would rarely buy anything at all – I can’t actually remember anything he did buy but he no doubt got enjoyment from just visiting them. When Dennis passed, I was asked if I wanted to visit at the Funeral Parlour – I decided not to. Every time I think of Uncle Dennis now I remember him on the night we all went out to celebrate his birthday at a local restaurant. Dennis was smiling and he was happy – nothing too extravagant but a night out with family and something to eat was good enough for him. The photo on the front of the service sheet today is Dennis on that night. So, no award as such for Uncle Dennis, but neveretheless, a man that gave so much time to helping others for little or no reward. But someone that will be sadly missed and someone that will live on through others, others that will remember a man that was quiet and humble, someone that got on with their life and helped others when he could, a role model of sorts in world when those qualities are not always plain to see.